You remember my bathroom makeover, right? What I didn’t tell you was how darn hard it was to find shower curtains that were NOT the standard size of 72″. I went into multiple stores and was extremely disappointed with the lack of selection. 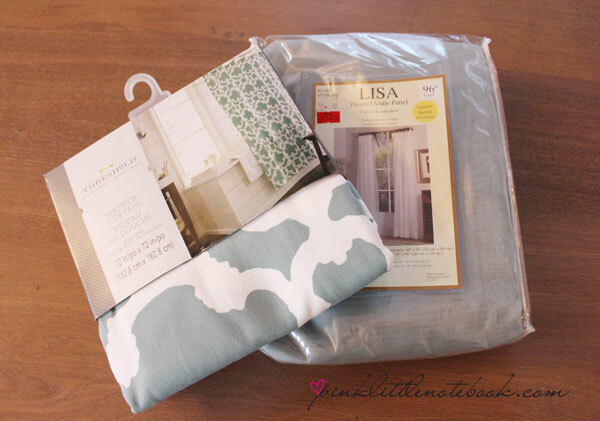 When I finally did come across 96″ shower curtains, they were usually solid colours of either white or beige (errr not what I was looking for). 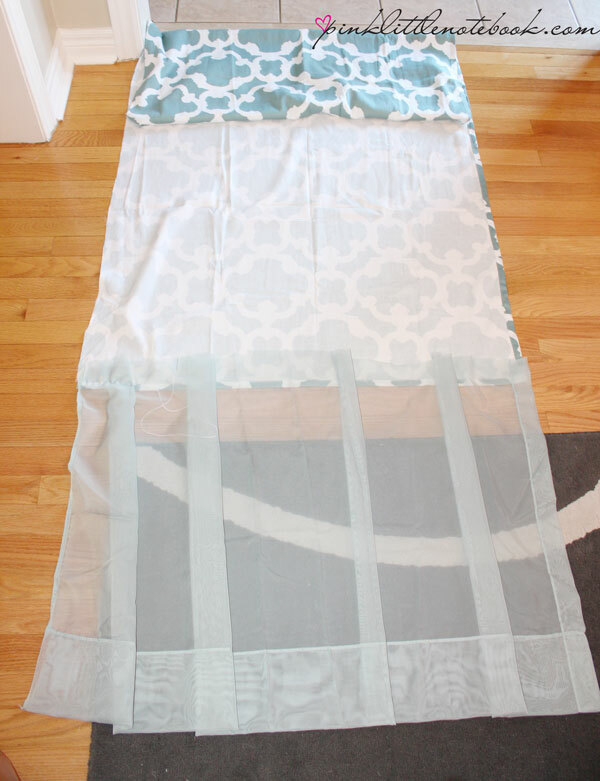 So here’s how I took an ordinary shower curtain and transformed it into a beautiful ceiling-to-floor bathroom curtain. First, I found a really cute shower curtain. This one is from Target. With scissors in hand, I cut the shower curtain directly in half. Make sure you cut as straight as you possibly can. Next I found this sheer window covering at my local fabric store, FabricLand, which matched the colour of my shower curtain perfectly. I measured and cut out the exact amount I needed in order to get a total of 96″. I wanted to make pleats so I overlapped the material every few inches. I also picked up this wonderful HeatnBond tape. My new favourite product, may I add! 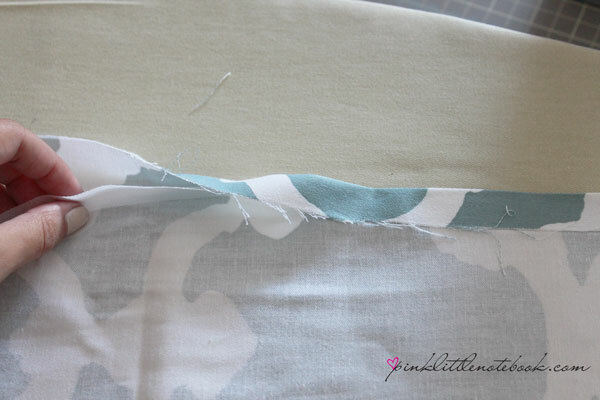 It’s a quick and easy way to hem without sewing! Just add the tape to the pieces you want to bond together and use an iron to activate the glue. In my case, I attached the extension at the bottom of the shower curtain and I also used it to create a straight hem on the edges I cut. Have you used this “iron on” tape before? What did you use it on? I love your shower curtain! I’m a huge fan of iron on hem tape, it just makes so much sense. Like why would I want to spend twice as much time on something that won’t look as nice if I tried to sew it. I think I’m out but need to pick up some more at the store. For me, its one of those crafting items to always have one hand. Why learn to sew when you have hem tape!! Absolutely love the product too! Thanks for the comment Gloria! What a great idea – I love anything that is no sew! I love the colour you picked too…gorgeous! I love your idea and your finished product, but I’m wondering if the bottom portion gets wet. I was thinking of doing the same thing but using a second shower curtain—either matching or coordinating—for the bottom pieces so they’re more water resistant. Thanks for the idea and the great inspiration. I also love your color-coordinating chandelier, too! Hi! 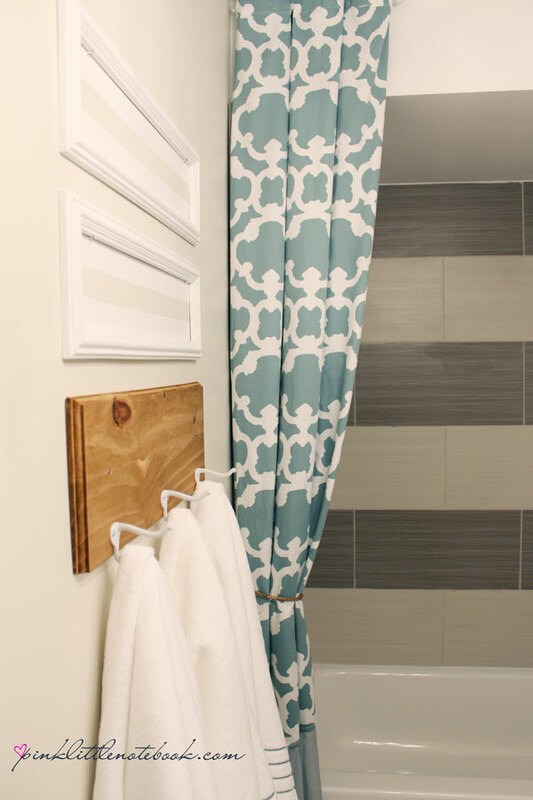 I’m about to make a fabric/pvc wall panel to keep my kids from falling off the deck into our pool, and I would love to use the hem tape on shower curtains for the panels. 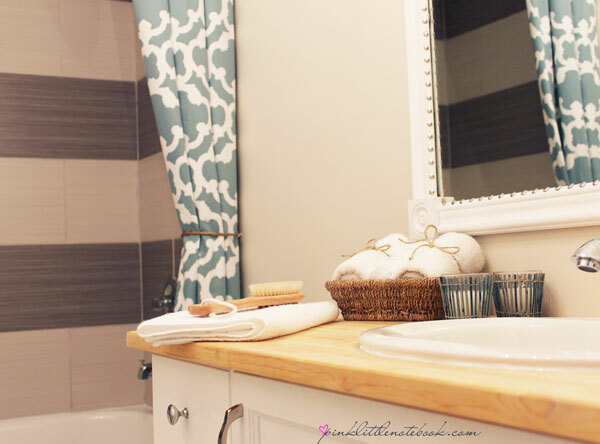 How has the hem tape held up so far in your bathroom? Is it durable enough for the heat/steam? I hope you say yes! I love this idea and plan to tackle this project this weekend. I was wondering if you could share more pictures of the curtain with the added material? I want to get a better look at the pleats. 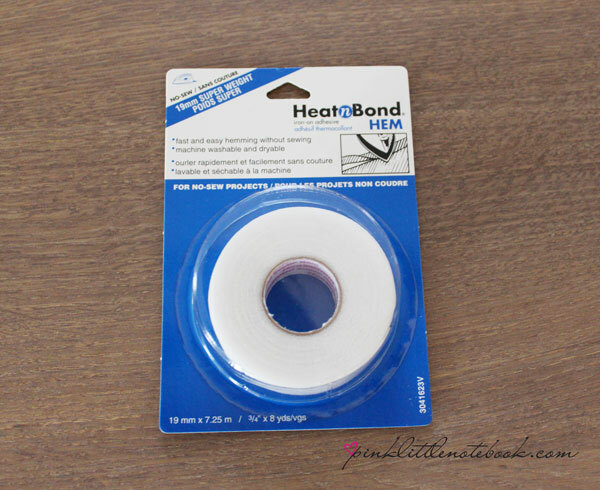 Did you heat-n-bond the pleats together and then attach to the curtain or all at once? Just kidding! I just noticed you put in a link 🙂 thank you! I love it!! I actually was thinking about doing the same thing to my shower curtains. 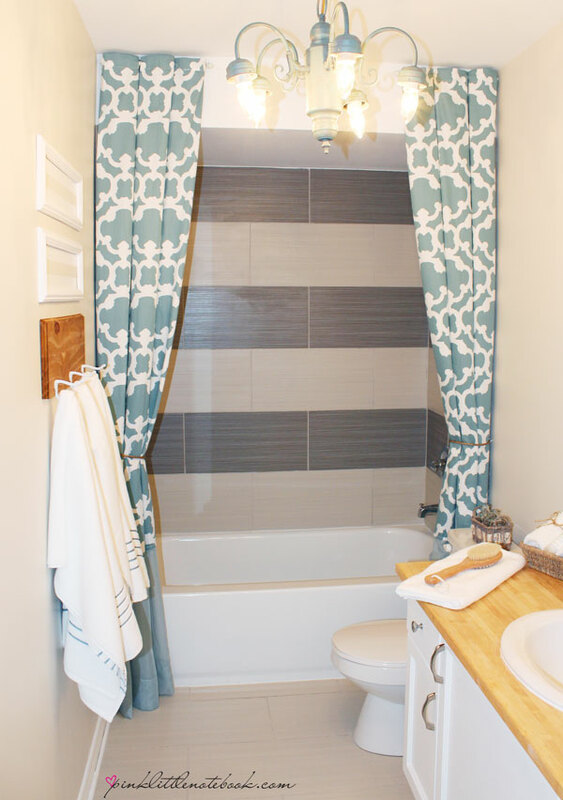 I have a white shower curtain that I wanted to cut to add on to the bottom of my current shower curtain in my master bath to allow me to do the floor to ceiling shower curtain. This is the article that I have been searching for weeks for!!! Thank you! Glad to hear Yvette! I still love and use these shower curtains today! Hey Sabrina! I love this idea! I actually have the same dilemma with the same exact curtain! My question is, I don’t see the clear liner for the shower in the picture. did you cut the clear liner to tie back on each side? Hi Brittany, I added a clear liner after the pictures where taken. I added a shower rod (where you would normally put one) and attached the liner there. I kept the clear liner tucked behind one of the shower curtains when not in use.